A good place to start when figuring out how much data you need is to find out what you’re currently using. You can do this either by checking your phone bill or directly on your phone. Android: Go to “Settings,” then “Data usage.” You’ll see your total usage for a given date range, which you can change to match up with your billing cycle. iPhone: Go to “Settings” under “Cellular.” If you haven’t set a date range, it shows your total usage since activating the phone. Click “Reset Statistics” to start tracking your usage from a specific date. If you’re still uncertain on your data needs, Whistleout has a neat Estimator. Which gives you a ball-park figure on how much data you need based on how many emails you send, how much you stream, upload, and download etc. Lastly, don’t worry if you don’t get the right plan right off the bat. At US Mobile you can top up anytime during the month without any surcharges and you can change your plan from one month to another in order to optimize the plan according to your usage. And if you’re looking to save even more data, check out our last blog post on how to Save Data on Facebook with a Few Simple Clicks. Don’t get fooled by other carriers’ data claims. Many carriers throttle your internet speeds after you go over your the cap on your data plan. For example with carriers like AT&T, once you go over your data limit of say 10GB of data, you’re throttled to speeds as slow as dial up. Not only that often times you’ll see that your data speeds fluctuate. One day you’re streaming YouTube videos with no problem, and a few days later all you see is the endless loading wheel. We suggest you use a tool like Ookla Speed Test to monitor your data speeds. At US Mobile we don’t throttle your speeds. What you get at start of your bill period and what you get until the end of your bill period is consistent. If you reach your data limit your data is shut off, but you are given the chance to top up your data plan for the next 30 days. 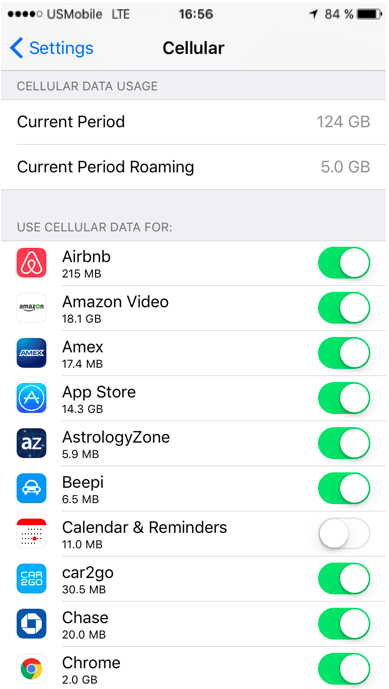 This way if you think you’re going to go over your data this month you can add more data, without having to commit to a higher data plan every month.